The flavours of the orchard always feel so right with sweetly flavoured pork, and an appley riff on a gremolata perks up this dish no end. The bone marrow can be scooped out at the table and enjoyed as an extra treat. Over a medium heat, warm half the oil in a large casserole, add the pork and brown on each side. This will take about 5 minutes over a medium heat; do it in two batches if necessary. Remove to a plate. Soften 3 shallots in the remaining oil, stirring, for 5 minutes, until golden in places. Add the flour and cook for 1 minute further. Add the garlic, then gradually stir in the cider, stock and sage. Return the pork to the pan and bring to the boil. Reduce the heat to a gentle simmer and cook, covered, for about 2 hours. Remove the lid for the final half-hour to let the sauce thicken. The meat should be very tender. For the mash, cut the potatoes and celeriac into large chunks and put in a pan with a pinch of salt. Cover with cold water and bring to the boil. Simmer for 15 minutes or so, until tender. Drain, return to the pan and set on a very low heat for 1–2 minutes to dry out. Pass through a ricer or mash with the butter and milk; season. For the gremolata, finely chop the shallot and gently sauté in the butter for 5 minutes. Add the sage and apple and cook for another 2 minutes. Season to taste and stir in the walnuts and lemon zest. Remove from the heat. 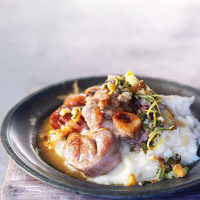 Serve the osso bucco with the mash and spoon over the apple gremolata. This is a most cider-friendly, Italian classic.